Go where no pizza has gone before! Nifty gift for the Trekkie pizza lover! Star Trek fans must slice their pizza in style. 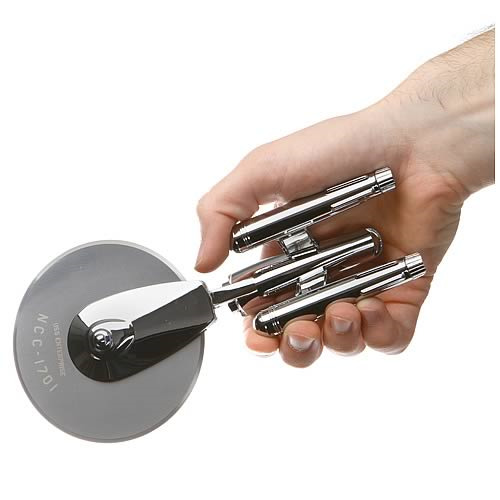 This metal pizza cutter in the form of the famous NCC-1701 Enterprise ship from Star Trek: The Original Series features a laser-etched stainless-steel blade with a solid zinc-alloy, chromium-plated body. The Enterprise Pizza Cutter measures approximately 9 3/4-inches long x 5-inches tall x 2 3/4-inches wide.